Second Lieutenant Walter David Ehlers is a former U.S. Army soldier and a recipient of the U.S. military's highest award for valor, the Medal of Honor, for his actions during World War II. Walter David Ehlers was born on 7 May 1921, in Junction City, KS. Ehlers joined the Army from Manhattan, KS. He and his older brother, Roland, served in the same unit and participated in the fighting in North Africa and Sicily. 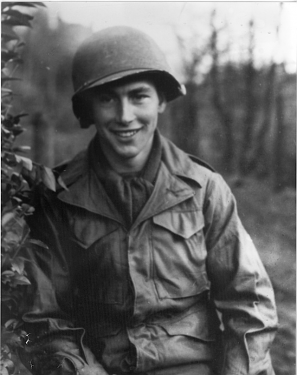 On D-Day, 6 June 1944, Ehlers was a Staff Sergeant and squad leader in the 18th Infantry Regiment, 1st Infantry Division. His squad, part of the invasion's second wave, waited off shore in a Landing Craft, Infantry, while the first group of soldiers landed. When the first wave became pinned down on the beach, his unit was transferred to a Higgins boat and sent forward early to assist. They fought their way off the beach and by 9 June were near the town of Goville, 8 miles inland. On that day, he led his unit's attack against German forces and single-handedly defeated several enemy machine gun nests. The next day, his platoon came under heavy fire and he covered their withdrawal, carried a wounded rifleman to safety, and continued to lead despite his own wounds. For his actions, he was issued the Medal of Honor. 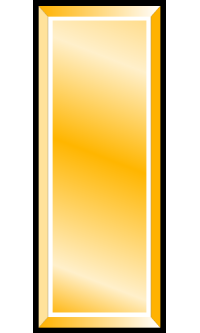 Rank and organization: Staff Sergeant, U.S. Army, 18th Infantry, 1st Infantry Division. Place and date: Near Goville, France, 9-10 June 1944. Citation: For conspicuous gallantry and intrepidity at the risk of his life above and beyond the call of duty on 9-10 June 1944, near Goville, France. S/Sgt. Ehlers, always acting as the spearhead of the attack, repeatedly led his men against heavily defended enemy strong points exposing himself to deadly hostile fire whenever the situation required heroic and courageous leadership. Without waiting for an order, S/Sgt. Ehlers, far ahead of his men, led his squad against a strongly defended enemy strong point, personally killing 4 of an enemy patrol who attacked him en route. Then crawling forward under withering machinegun fire, he pounced upon the guncrew and put it out of action. Turning his attention to 2 mortars protected by the crossfire of 2 machineguns, S/Sgt. Ehlers led his men through this hail of bullets to kill or put to flight the enemy of the mortar section, killing 3 men himself. After mopping up the mortar positions, he again advanced on a machinegun, his progress effectively covered by his squad. When he was almost on top of the gun he leaped to his feet and, although greatly outnumbered, he knocked out the position single-handed. The next day, having advanced deep into enemy territory, the platoon of which S/Sgt. Ehlers was a member, finding itself in an untenable position as the enemy brought increased mortar, machinegun, and small arms fire to bear on it, was ordered to withdraw. S/Sgt. Ehlers, after his squad had covered the withdrawal of the remainder of the platoon, stood up and by continuous fire at the semicircle of enemy placements, diverted the bulk of the heavy hostile fire on himself, thus permitting the members of his own squad to withdraw. At this point, though wounded himself, he carried his wounded automatic rifleman to safety and then returned fearlessly over the shell-swept field to retrieve the automatic rifle which he was unable to carry previously. After having his wound treated, he refused to be evacuated, and returned to lead his squad. The intrepid leadership, indomitable courage, and fearless aggressiveness displayed by S/Sgt. Ehlers in the face of overwhelming enemy forces serve as an inspiration to others. On 14 July, more than a month after D-Day, Ehlers learned that his brother, Roland, had died at Omaha Beach when his landing craft was struck by a mortar shell. Walter David Ehlers played West Point cadet Mike Shannon in the 1955 John Ford film The Long Gray Line, starring Tyrone Power. When he returned to his hometown of Junction City he tried attending college on the G.I. Bill but found he couldn’t pay attention in class – he couldn’t settle down “after being in all that,” his wife Dorothy said. So he got a job as a benefits counselor with the local Veterans Affairs office, and when he had the chance, transferred to an office in southern California. California was where he met Dorothy ice skating, and the two of them would be married for nearly 59 years. Ehlers stayed busy by volunteering with the local Boy Scouts troop and playing harmonica. He was also a regular visitor to local schools, where children would sit raptly and listen to his stories of patriotism and courage. 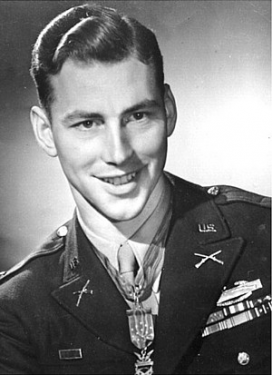 Second Lieutenant Walter David Ehlers died of kidney failure on Thursday, 20 February 2014. He is buried at Riverside National Cemetery in Riverside, CA. 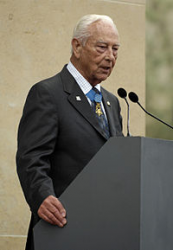 Ehlers speaking at a 2007 ceremony commemorating the anniversary of D-Day.